KSRealityBites: UK's youngest ever alcoholic! According to health officials, a three-year-old Briton who was treated in hospital for addiction to alcohol is thought to be the country's youngest ever alcoholic! The youngster was one of 13 people under the age of 12 who were diagnosed as alcoholics by the state-run National Health Service (NHS) in central England between 2008 & 2010. Health officials declined to give details of the three-year-old's condition or disclose the toddler's identity due to patient confidentiality rules. 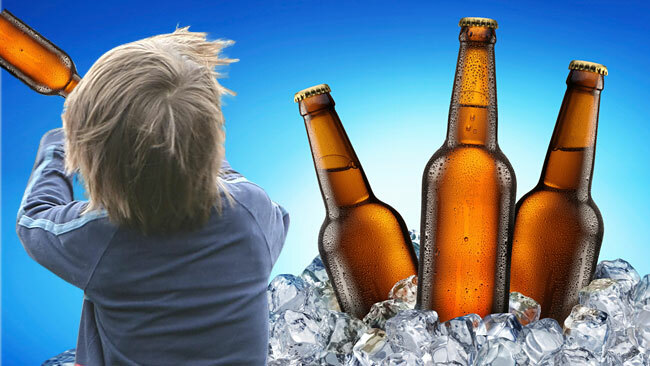 An NHS spokeswoman said: "We treat alcohol abuse very seriously, & 've specialist teams & experts on hand who are there to treat young patients with alcohol-related problems." The news, revealed by the NHS after a request under Freedom of Information laws, highlights Britain's uphill struggle to curb its heavy-drinking culture. It came on the same day that leading health groups blasted a government initiative on alcohol which involves asking drinks firms to sign up to pledges to cut binge & underage drinking. The groups, including the British Medical Association and the charity Alcohol Concern, accused the health ministry of letting the drinks industry dictate policy & condemned the pledges as neither specific nor measurable.